Fun. Our highly experienced staff know how to run fun, competitive, and effective training sessions & daily 7v7 and 11v11 games that will improve your skills and keep your attention. Experienced Coaching Staff. All players are coached by active, college coaches. 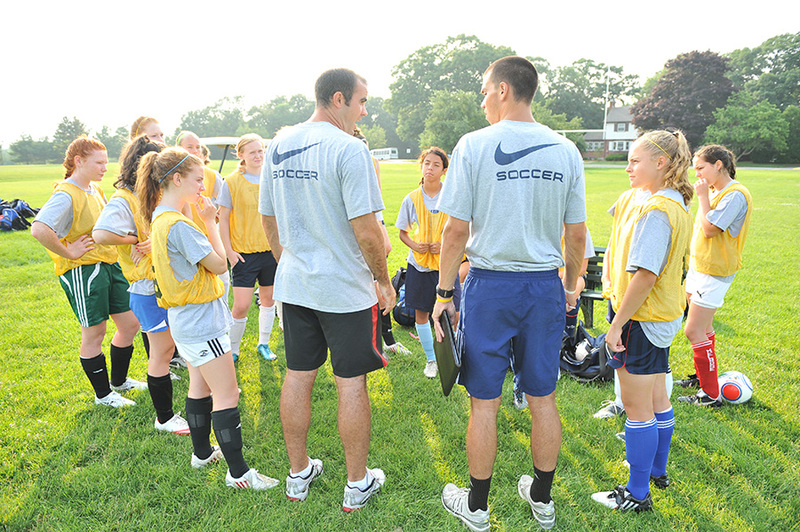 College coaches are running training sessions and directly interacting with participants. Players work directly with at least three college coaches and receive recruiting exposure to all coaches in attendance. 2017 Staff represented 48 colleges and universities. Personal Attention. Attendance at each academy is limited in order to provide an intimate recruiting environment and specialized 1-on-1 instruction. Ratio of players: staff = 7:1. Comfort. Lasell College offers a safe and convenient residential camp experience. Students stay in air-conditioned dormitories and top-quality meals are provided in the recently renovated air-conditioned dining hall. All fields and living/dining areas are in close walking distance. Diversity. Compete with players from all over the country and around the world. Over the last 10 years, participants represented 50 countries and 49 states. Guidance. Each player will be directly coached by three college coaches or more. You will receive two personalized player evaluations by your college coaches. Specialized Training. Our staff include a soccer-specific strength & conditioning coach, a yoga instructor and a Goalkeeper coach, who leads specialized training sessions for keepers. Two certified athletic trainers are also available. Ease of Travel. Fly into Boston Logan Airport and we can provide curbside shuttle pick-up at your terminal. We will work with you to make travel stress-free. Call us to discuss details. Health & Safety. We run background checks on all staff, purchase private camp insurance for each player, and comply with all regulations of the local and MA Dept. of Public Health. The dining hall can accommodate special dietary restrictions and our health care supervisors are available 24-7 for specialized medical needs.